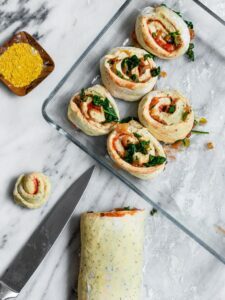 Who is excited for vegan pizza buns?! 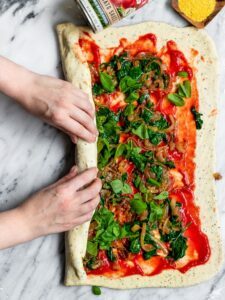 I know I’ve been teasing you all with a more savory bun recipe for a while now, so I am overly excited to share this recipe for Vegan Caramelized Onion & Spinach Pizza Buns with you today! This is a sponsored post written by me on behalf of Muir Glen & The Feed Feed. The opinions and text are all my own. Thank you so much! 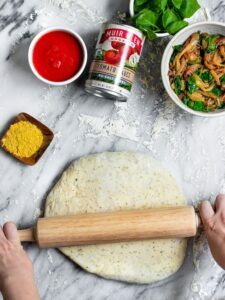 Before we jump into the recipe, let me tell you a bit more about a crucial ingredient for this recipe- Muir Glen Tomato Sauce! I’ve used Muir Glen tomato products for a while now & absolutely adore the taste. They pride themselves on being organic, zero waste, & on working with their local pollinators (aka bees!) to keep their ecosystem alive and healthy. If you’ve been reading this blog for a while, you know these are all values I 100% align with. In case you’re looking for an excuse to buy some Muir Glen tomatoes, they just happen to have a really great promotion coming to the Central Co-Op in Seattle this January. From 1/16-1/29 you can buy 10 cans of 14.5 oz canned tomatoes for $10 TOTAL. If you’re not local to Seattle, you can find your local co-op by searching the site HERE! 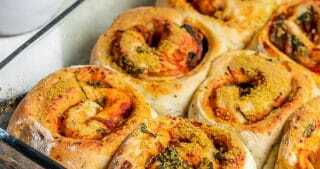 The Vegan Pizza Bun Recipe! The key to making this dough at home is to let it rise covered in the fridge for 24-48 hours. 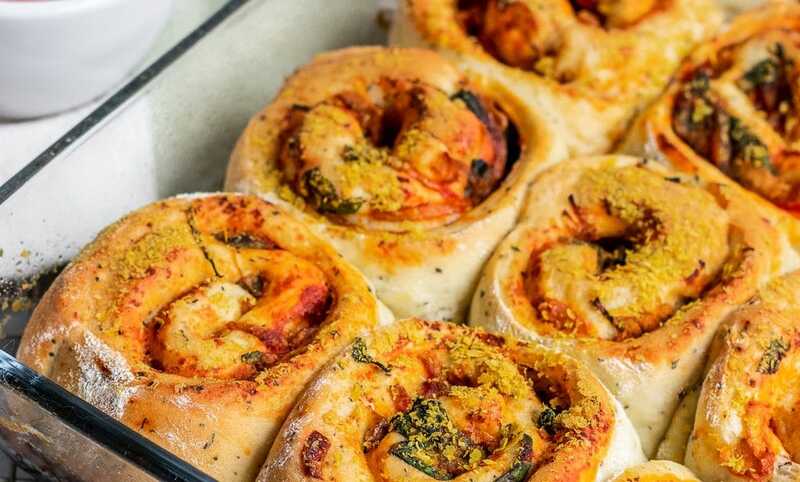 This allows the yeast to slowly ferment and brings out the best flavor in the dough. If making homemade pizza dough a day or two ahead of time sounds like too much work, that’s okay! 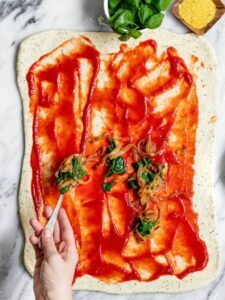 Store-bought dough works just as well and is a great replacement for the pizza dough part of this recipe. Remove your dough from the oven about 1 hour before you’re ready to bake the buns. Make the caramelized onions & spinach at least 30 minutes before you are ready to bake as well. Now assemble your ingredients! 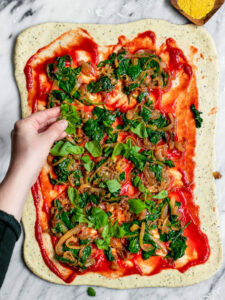 This includes your Muir Glen tomato sauce, caramelized onions & spinach, nutritional yeast, and fresh basil. Next, roll out your dough. 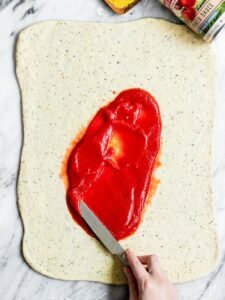 Spread the tomato sauce and make sure to leave a 2-inch border around the dough. Then, scoop on the caramelized onion and spinach mixture. For extra tasty buns, sprinkle on fresh basil! After all the toppings are on, roll the dough into a log. Pinch the edges of the dough together to seal. Cut into 12 even slices & place into a greased 9 x 13 inch baking dish. Sprinkle nutritional yeast on top to give the buns that “cheesy” flavor while keeping them vegan! Bake the buns at 375F for 34-38 minutes until the outside is browned and crisp and the inside of the buns are tender and cooked through. Okay, I lied, now it’s truly time for the best step. Step 10: Slice your buns & EAT! I hope you enjoyed this step by step tutorial. January is looking pretty savory here on SGTO. However, you know I couldn’t go a whole month without making another bun recipe. 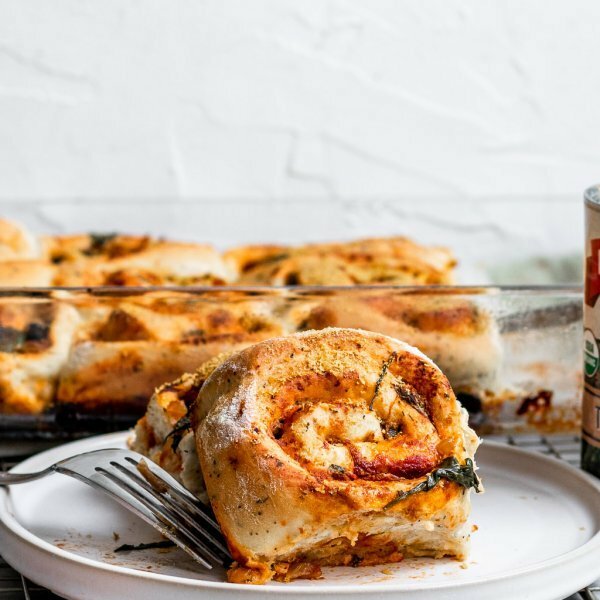 Just in case you’re looking for a sweet bun recipe to pair with these savory buns, check out these Vegan Pumpkin Pie Cinnamon Buns or Vegan Carrot Cake Sticky Buns! Add your warmed almond milk, salt, and sugar to a mixing bowl and whisk together. Next, add your yeast to the bowl and whisk. Let sit 10 minutes to make sure the yeast is activated and forming bubbles. Once you're sure the yeast is active, add in your oil and pizza dough spices and whisk together. Then, begin adding your flour 1/2 cup at a time and mixing together. 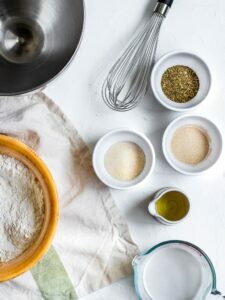 If you are using a standing mixer, use the bread hook to knead the dough until it is elastic and no longer sticking to the sides of the bowl (about 5-7 minutes). If you are kneading by hand, mix in all the flour to start. Then, flour your hands and turn the dough out onto a well-floured surface and knead for 5-7 minutes. Once the dough is kneaded, form into a ball. Place the dough into a well-oiled bowl, cover with plastic wrap, and let rise in the fridge for 24-48 hours. About 1 hour before you are ready to fill & bake the buns, remove the dough from the fridge and let sit for its second rise. Around 30 minutes before you are ready to roll and bake the buns, cook the vegetables. To caramelize the onions, begin by adding 2 Tbsp of butter to a large frying pan and melt. Once melted, add in the sliced onions and cook at low heat for 20-30 minutes until soft, sweet, and brown. Make sure to stir frequently to evenly cook the onions. Once the onions are caramelized, add the spinach to the frying pan, mix with the onions, and cook 2 more minutes until wilted. Remove from the heat and set aside. After the dough has completed the second rise, turn the dough out onto a well-floured surface. Dust your rolling pin with flour and roll the dough out into a 1/2 inch thick rectangle. Next, add the Muir Glen tomato sauce to the buns and spread out over the dough. Make sure to leave a 2-inch border around the dough without filling. Then, add the caramelized onion & spinach mixture on top of the tomato sauce and spread out evenly. Sprinkle the fresh basil on top. Now that all the toppings are on the dough, roll it into a log. 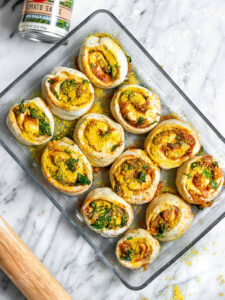 Make sure to tuck in the filling as you go so it does not escape out the sides of the dough. Pinch the dough together at the seam to seal the rolls. Then, roll the dough over so the pinched seam is facing down. Cut the dough into 12 evenly sized slices and place into a greased 9 x 13 inch pan. As a final step, sprinkle the nutritional yeast on top of the buns. Bake for 34-38 minutes until the buns are browned on the outside and cooked, yet soft, on the inside. 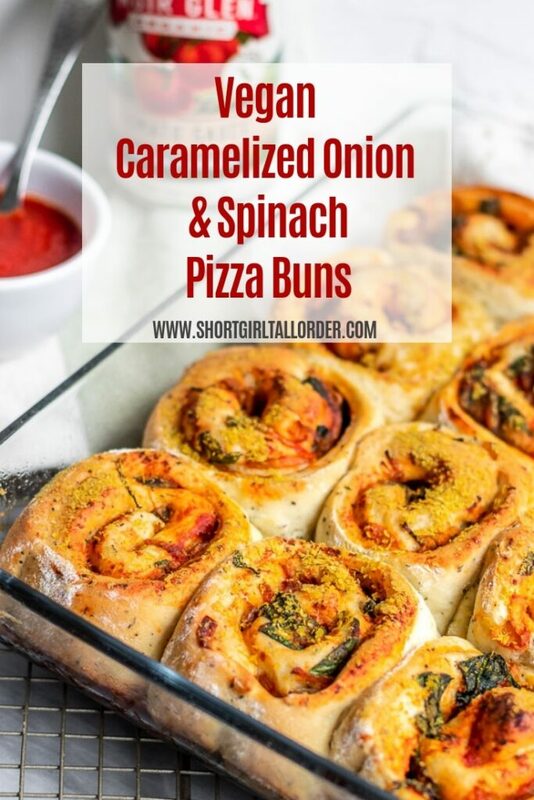 Slice the buns and serve with a side of warm tomato sauce for dipping. Enjoy! This looks so good. I just came across your site. Do you know how I can create a gf dough for it. Thank you so much!!! Thank you Joanne! 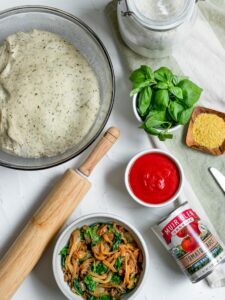 I haven’t personally created a gluten-free dough before however you can try substituting a 1:1 gluten-free flour mix and see if that works(I’ve heard Bob’s Red Mill brand is good). You could also buy pre-made gluten-free pizza dough and use that for the recipe. Hope that helps!